The Epsilon Sigma chapter of the Alpha Tau Omega Fraternity at Florida State University received the 2016 True Merit Award at the 82nd Biennienal Congress of Alpha Tau Omega Awards Banquet on August 6, 2016, in Charlotte, North Carolina. Vice President Dustin Miller ’14 accepted the coveted silver bowl on behalf of the chapter. “Because of Florida State’s proven success as a chapter, individual members enjoy a strong ATO experience that enhances their college education and makes them more valuable as citizens, currently on their campus, but very soon, as members of their respective communities,” said National Fraternity Chief Executive Officer Wynn Smiley. 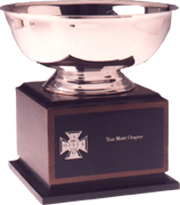 The True Merit Award emphasizes commitment to the mission of ATO, including positive community and campus involvement. The Epsilon Sigma chapter also excelled in the following chapter operations: Campus Involvement & Leadership Development, Scholarship, Recruitment, and Elevate (community service hours). The chapter’s Board of Trustees, led by Skip Smith ’79, was also recognized with the Fraternity’s Upper Alpha Award for outstanding service to the chapter.